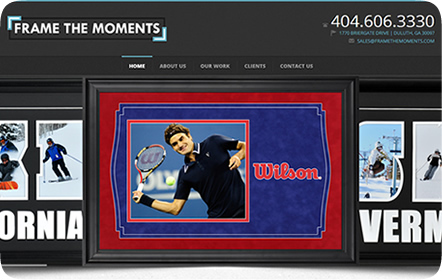 Frame The Moments is a custom-framing company that works only with quality materials to deliver the best framing solutions. 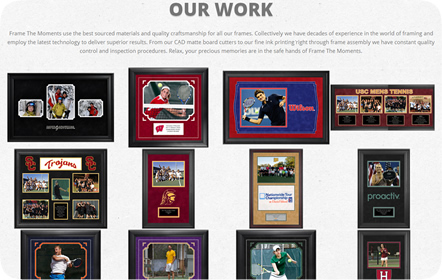 From outdoor winter sports to collegiate team photos, Frame The Moments will accomodate to your preferences to make the perfect gift for your corporate clients. 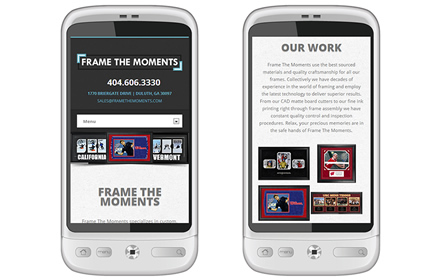 Because Frame The Moments is about framing, this new website needed to have a gallery that would put all of this company's work on display. The focus had to be on the frames themselves, not the photographs, so we created a gallery that imitates a wall of framed photographs. Here users can see the wide variety of style and size options available to them. The website is also responsive, adapting to any screen size and still functioning properly so all users can see their work no matter where they may be located.